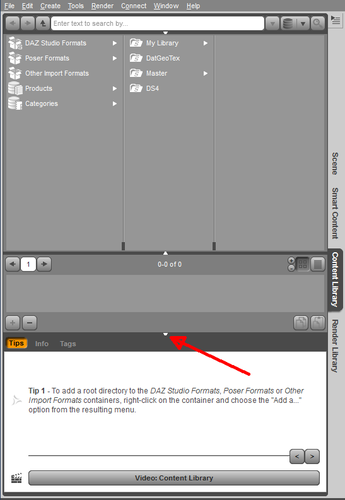 DAZ Studio Pro 4.7.0.12, General Release, Now Available! I can't find Animate 2 plugin in the DIM. My product library has the green button to download and install, but clicking it does nothing. When I click on the manual download button it offers me DS3_aniMate2_2.0.0.6_Win64.exe. Is that the correct version for DS 4.7? Why doesn't it show in the DIM? Is there some elusive filter I need to enable? I have Plugin, and software, and Windows 64 bit checked. Animate 2 is just adding the Serial number. No download required. Animate 2 is just adding the Serial number. No download required. Thanks. I guess I must have forgotten. The aniMate2 plugin is included with the standard install of DAZ Studio. It provides a 30 day trial. Once that trial expires you must enter a serial number or the plugin reverts to a "Lite" mode. When you purchase the aniMate2 product, in the case of DAZ Studio 4.x, you are purchasing a serial number. The page for aniMate2 in the Product Library provides a PDF (i.e. "aniMate2 DS4 Installation Guide" - the blue button) with this information and instructions on how to activate the plugin. Any idea when raytraced SSS brick will be available in Shader mixer? It's great to see the new version is ready, but I always try to wait with any new software update. I'm afraid I let others be the guinea pigs, but the new features do sound nice. Huh, I could have sworn I was seeing it until tonight...sorry, guess I'm just confused from trying to figure out why on earth DAZ decided on such an overly complex organization system for content. Do we really need separate folders for the materials of a prop? Couldn't just have nested folders like (outfit -> props -> MATs) instead of them spread all over friggin' creation? Ah well, I gave it a shot, now back to organizing them manually. The folder organization of these 3D programs like DAZ and Poser has always struck me as something created by insane inmates of a lunatic asylum. It follows bizarre patterns that have nothing to do with lucid thought or common sense. Unfortunately, it seems like the 'structure' such as it is has become a tradition so we just have to live with it. But I like to think is a special place in the Hell waiting for the people who first thought up the term 'Runtime' and all the rest. It's all right there on the product page. I just didn't scroll down far enough to the "Notes" section. And what's worse is that I "knew" this, but I forgot. It is a nice refresher to see all the information together here in your reply, complete with links. I bet it will help some other forgetful people, too. Thanks Rob. For those, who like me, use the keyboard to navigate through the content and not the scene : Windows\Workspace\Customize (F3) : remove the shortkey in the View Control Action. Or just use the Keyboard looking icon in the toolbar to disable it, temporarily. You get the best of both worlds. Vanity directories are the worst though. I may love the stuff that Faveral, Merlin, Stonemason, and many other merchants make, but I don't need their stuff buried in MerchantName -> Fantasy -> Environments -> Exterior -> ProductName with the lights and materials in two separate folders miles away (not that those PAs are necessarily guilty of that, it's just an example). Is there really anything wrong with Props -> Environments -> ProductName? Wow IPR is a pretty cool feature, works like the Luxrender had to figure out how to change the viewport BG color found it! That's really a content issue, though, not a DS issue. Nothing in DS stops people from putting the poses with the products - and in fact things like foot poses for shoes often are placed with the main product. I thought everyone believed I had the corner on complaining! I just installed the new version. Installation went smoothly. I installed the 4.7 update through the manager. When i get into daz the Smart Content looks all out of wack. nothing is organized. Help? I don't have the information in front of me. The short answer is to go to the top of the pane and select "all" and it will look very close to what you are used to. Ohhhh. Okay, got it. Thanks! Nice graphics! Welcome to Snazulon. Please give us the option to either turn off the Tips tab in the Content pane. I'd rather, *if* there is an insistence of it being there, have an option to move it to the last rather than the first slot. I'd much rather have the Info tab first as it's more relevant to what I'm loading. Keep in mind you have ALLOT of seasoned users here and I highly doubt any of them bother with that tab. I just fine is annoying that I can't either hide that particular tab or move it. One question : Can I reinstall last 4.6 version, with 4.7 in place ? I mean, will the 4.6 installer propose to uninstall 4.7, like in other updates where it uninstall prior version ? Can you post a screenshot of what you're seeing? Click on the little triangle in the center of the dividing line between the content and the tips portion to fold up the tips. Yea, I know all about that (seasoned user here) But I want the ability to move the Tips tab over behind the Tags tab and have the Info tab first since I refer to that one often. just got usd to daz 4.6 ...lol now backdrop is gone. so where do I find this new environment panel and wher can i change colors for viewport etc? Could anyone help me with the opposite kinda thing? I'm using the scripted renderer, and the old sample script (and hence anything based on it) can't seem to process the background properly anymore - I can't make it render with a transparent background (looks like either dz3DViewport class got changed, or there is a new class I need to use, but I can't find anything in the scripting docs). I would very much appreciate any tips towards getting back in control over it. Now, I have problems with toonycam pro. ID outlines by difuse color doesn't works since some point when I installed general release. It was working in beta, before General release.